If you are football fan, this is your time of year. The temperatures are dropping and the playoff picture is heating up. My house is buzzing on Sunday with a fire, the big game, and some of my favorite Cajun dishes as our divided house cheers on the Packers, Saints, and anyone playing the Bears. If you are a business owner, this can also be your favorite time of year. The National Retail Federation estimates that the average American will spend around $700 on holiday gifts, goodies, and treats this year. That adds up to an estimated $465 billion and you should be getting your piece of that. The challenge for most business owners is that they just don’t know how to capitalize on this opportunity. 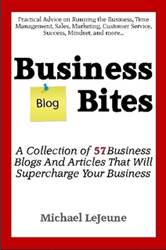 If you are looking for inspiration to help capitalize on this holiday season, you are in luck. I’ve assembled 8 of my favorite strategies for quick wins during the holidays. These strategies are market agnostic and meant to be fairly easy to implement. If you have questions or need clarification, please reach out to me via email at michael@michaellejeune.com. 1. Invest in marketing – Most companies don’t realize how important marketing is at this time of year. In fact, a lot of companies try to dial back their marketing at this time of year because they think it will get lost in a sea of mail. While there is some truth to that, you also have to understand that your competition is marketing to your potential clients during this season and you are risking losing them to the competition if they are the only voice that your clients / prospects hear. My advice is to think more along the lines of multi-touch campaigns or even multi-media campaigns. A multi-media campaign targets various forms of marketing such as direct mail, social, online ads, email, radio, etc. Hit your prospects from multiple sources for the best impact. But for heaven’s sake, don’t fall into the trap of shutting down your marketing during the holidays. It’s a massive mistake that can cost you dearly. 2. Capturing leads – This is actually a year-round strategy, but especially important during the holidays when your in-store, online, and call traffic should be higher. I review hundreds of small business websites, marketing pieces, ads, and strategies each year and my number one complaint for 99% of them is that they are solely focused on a sale. This is a bad strategy. I relate it to proposing the first time you meet someone. Imagine Lloyd Christmas style from Dumber and Dumber when he first meets Mary and goes for the long hug at the airport. Awkward… Don’t get me wrong. It totally makes sense going for the sale, but what’s your fallback to that? The answer is usually nothing. That’s why it’s so important to build in a lead contact capture strategy into whatever you are doing. Think of it this way. If you capture their contact information, you can market to them later. If you don’t, you just wasted your marketing dollars on people who aren’t ready to buy yet. So make sure your websites have a lead capture strategy right on the front page or on any of your landing pages for ads and make sure all of your marketing gives an incentive for prospects to at least register for something online. A lot of people use bonuses, free downloads, a free copy of their book, a buying guide, a case study, or some other form of goodie to get people to share their contact information with them. 3. Quick wins through promotions to your current customers – One of the most valuable assets to any company is your database of current customers / clients. However, it’s only valuable if you use the database. The holidays are a perfect time to reach out to your current customers with a special promotion. In fact, I often suggest creating a VIP / Membership program during the holidays if you don’t already have one and launching it at this time. You can do a great promotion for this via direct mail and email and offer your current customers exclusive access to your new program along with special discounts, bonuses, bundles, etc. 4. Irresistible offers to reel in new customers – One of the things I’m constantly harping on with clients is for them to create irresistible offers for their marketing. You want a prospect to look at your offer and think to themselves, “I can’t pass this up”. This strategy will increase your response rate and conversion rate by several hundred percent. The other great thing about this is that it gets you a new client, gets their contact information, and it lets you continue marketing to them. Focus on something simple that’s easy to understand. A great example is one of the irresistible offers I use. When I speak, I offer a 1-hour consultation, review of your website and marketing materials, and a copy of both of my books for $20. The value of this package is around $600. I also sweeten the deal by not taking a credit card upfront and offer a 100% satisfaction guarantee. If the client doesn’t feel they got their $20 worth, I don’t charge them a dime. Pretty irresistible if you ask me. 5. Direct mail – I keep hearing clients say that direct mail is dead, but that’s simply not true. Would you believe that direct mail actually has a higher conversion rate than any other marketing strategy we use? We have tested this in many markets and industries and direct mail done correctly, still outshines most other marketing strategies. As with everything, there are exceptions, but I’m here to vouch for direct mail. The key is standing out from the rest of the mail. You can do this many ways. One of which is using oversized postcards, oversized envelopes, or something we call shock and awe kits which is actually a box of marketing materials. The other factor is to make it simple. If the offer is too complicated, prospects won’t bite. There’s a reason great copywriters like Dan Kennedy make six figures just to write one direct mail letter. And that reason is because direct mail still works extremely well. 6. Social media – You would ideally build up your presence on social media before starting a marketing campaign for the holidays, but it’s not completely necessary. In fact, you could run social promotions with the intention of building your followers. What you have to understand is which social platform your prospects are using. For example, an under 20 demographic is more likely to look at Twitter, Snapchat, or Instagram, while an older demographic is more likely to only use Facebook. Once you nail down which social platform is best for your demographic, you need to focus on what your social media strategy should be and how you want to deliver your messages. 7. Differentiation – For some companies, the holidays are a slow time of year. In fact, it’s a slower time of year for my business. 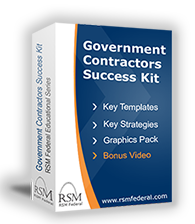 In addition to being a founder member of my own coaching practice, I’m also a Senior Consultant and Program Manager for RSM Federal where most of our clients are government contractors. So this is traditionally a slow time for government work. With that in mind, I’ve always suggested that clients use slow times of the year to look at new markets such as government contracting and to use this downtime to brainstorm ways they can differentiate from their competition. What can you do during the holidays to separate your business from your competition? An even better question is; what can you do to separate your business from the big companies in your industry? I highly encourage my clients to look at their customer service and client communication as a point of difference. How do you treat people and how do you talk to people? Can you hire a great copywriter to recreate your messages, spruce up your marketing pieces, and come up with better hold messages? Do you need to create some new policies and procedures for how your employees interact with customers? If so, you probably need to script this and do some training on it. The objective with differentiation is to get people to say, “Wow, those folks are different”. You want them to love your company and spend money with you because of who you are and not just because of what products and services you provide. More importantly, you want them to choose you because of how your company makes them feel. 8. 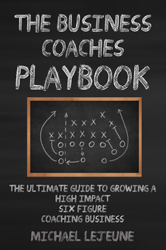 Hiring a coach – Last but not least, I suggest you hire a coach. I know, it’s not only obvious, but brilliant right. It’s that or makes me look like a schmuck. Either way, it’s the truth… A great business coach (cough, cough) like myself, really understands the fundamentals of business and can give you a massive advantage to growing your company. It’s our job to understand the techniques, strategies, and short-cuts that your business needs and more importantly, how to implement them. A great coach will typically cost you about as much as a great admin assistant (around 25 to 40K per year depending on the coach and what they are doing for you). However, they should be the highest ROI person on your team. For example, one of my clients recently more than doubled their revenue from $350K to $765K in our first year. They also decreased cost and increased profitability by more than 20%. The bottom line is that a great coach can help you leap frog over obstacles, solve some of your biggest challenges, and do it all at a price that not only makes sense, but makes you a fortune in the process. So what happens if you don’t have the extra cash to implement these ideas? A couple of thoughts on this. The first is that you have to be willing to wisely invest some money in order to grow your business. All too often, I run into companies who aren’t willing to invest in their business. And inevitably, those companies either fail or fail to achieve the results they desire. So first and foremost, be willing to invest some cash in the growth and health of your company. There are a lot of ways to get the extra cash you need. You can lower your costs, sell some personal items or old equipment, or get a loan. For most companies, I suggest having a line of credit. Even a small line of credit can go a long way toward implementing these strategies. You can check with your local bank or one of many online sources. I really like Kabbage. They approve funding for businesses based on real life data, not just a credit report. They link your bank, PayPal, or other accounts and review payment transactions to qualify you on the spot. This unique credit line method gives people with a lower credit score a better chance of getting approved as long as they have a transaction history to support the credit line.